This is without a doubt a parent's worst nightmare. Having a child disappear and being totally helpless as to what you can do. 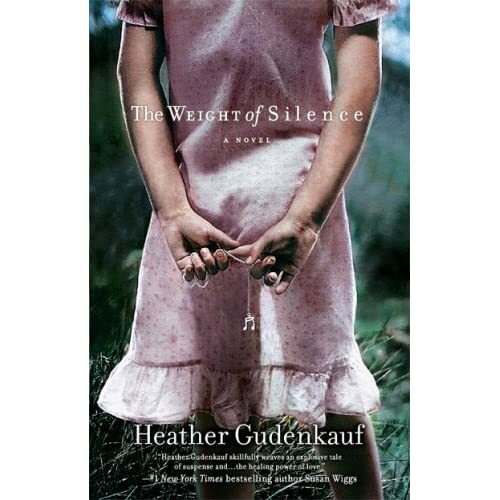 Heather Gudenkauf, author of The Weight of Silence, captures the raw emotions from several people's perspective. I started reading this book late in the evening - after my children were tucked snug in their beds. I didn't put it down until I was done at 1 in the morning. I just couldn't stop reading - I wanted to know what happened next. By the time I was finished I felt a mirage of feelings - numb, yet pleased, sad but at the same time satisifed. I know what a weird combination, huh...and you may not understand it, until you read the book. I went to bed soon after, but not before I checked the doors (twice) and kissed both my babies. This is a story about families, love, tragedy, and hope. I highly recommend reading this amazing debut book. I feel it will make you appreciate what you have and hold onto everything a little bit closer. Thank you MotherTalk for giving me the opportunity to read such a touching book. Oh if it's that good, then I definitely want to read this one! Thanks for sharing your review ; )I put it on my wish list. I started a new book last night, I haven't been able to read anything since Twilight - I think it scarred me LOL.